The proper maintenance and repair of domestic, family and private vehicles greatly reduces the likelihood of car problems. Garage2U offer a full set of servicing, diagnostics and vehicle repair services for all types of domestic vehicles. Our services are all carried out by fully-qualified mechanics at a competitive price, and we come to your home to cut down on the disruption to your day. Everything about our friendly, professional service is designed to make your life easier. Regular servicing will reduce the likelihood of vehicle breakdown. Our services are carried out by qualified and expert mobile mechanics, and will not affect the manufacturer's warranty vehicles still within their 3-year warranty period. Our qualified and experienced mobile vehicle technicians carry out mechanical and electrical repairs - including MOT repairs and engine overhauls - to all makes and models of domestic vehicles, including performance and prestige cars. Our fully-qualified vehicle technicians can come to your home to carry out diagnostics. Diagnostics is one of our areas of expertise. 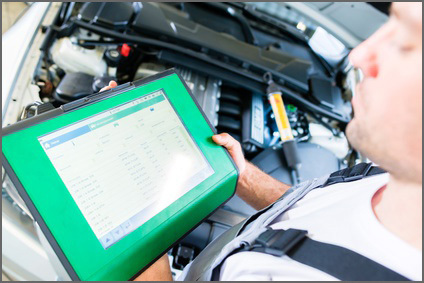 We discover and execute repairs on a range of faults found on private vehicles, including engine management systems (EMS), airbag systems (SRS), anti-lock braking systems (ABS), traction control (TC) and air-conditioning (AC). In our experience, almost 75% of cam belt failures occur because of tensioner or pulley failure, and we therefore recommend customers have a cam belt kit fitted when required. If cam belts are not regularly maintained (and replacement when necessary), serious engine damage will almost certainly occur in your vehicle. Fitting cam belt kits is a complex and precise job, and we are pleased to offer this service as one of our areas of expertise. Our mobile vehicle technicians are qualified to carry out repairs and servicing to all types of vehicle air conditioning systems. Garage2U can replace and fit all makes of tyres to domestic vehicles, MPVs, prestige cars and performance vehicles. To make life easier for you, we carry out tyre fitting at your home. We will always advise honestly on the condition of your existing tyres and give you our opinion on when the other tyres are likely to need replacing.